In this article we present the best hand cream for dry hands. In the East/West Hands Division, the competition can get a little touchy. But, the teams in this division won’t be pushed around. The hand creams in this division are marketed specifically for use on your hands. Many of these are also very good for use on other parts of the body. As usual, the fan base for the teams in this division support their teams with strong reviews. All of these lotions come highly recommended. We know dry cracking skin on your hands can not only be ugly and embarrassing, it can also just be painful and make simple tasks become very difficult. Each of these teams have unique attributes. We’re sure that if you’re looking for dry hand skin relief, that one of the teams can be your hand savior. Please find below what Lotion Challenge League found as they researched what teams would best represent this division. These teams outperformed other pretenders in terms of customer satisfaction. And, were the products that not only pleased the highest percentage of customers, they also offended the smallest number of customers. The Lotion Challenge League is very picky regarding what teams are allowed to joing the league. So, even if the ratings look good, if there is something that negative reviewers point out that seems like a valid complaint, that product won’t make the cut. This leaves us with what we feel are the best hand creams to be found anywhere. I have problems with dry hands, especially during the Winter and Spring months. I always seem to notice it most while driving. I like to keep lotion in my car so I can apply it while I am thinking about it. I tried a number of different lotions, but I noticed that most left my hands sticky or greasy which is bad for gripping the steering wheel. 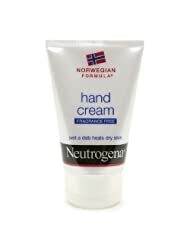 Neutrogena Norwegian Formula Hand Cream dries leaving my hands feeling great. It is the right amount of moisture without leaving my hands sticky or greasy. Another plus, it has no fragrance. When looking for a lotion that helps with dry cracked hands, this is a product that has worked well for the reviewers. Neutrogena has our personal stamp of approval and gets our vote as the best hand cream anywhere. The Body Shop provides bath, body, skin care, hair care, and many other products to improve your body. 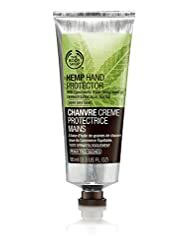 The Hemp Hand Protector cream is one of the most popular creams that they provide. The Body Shop says this cream is tested by dermatologists. The secret ingredient for this cream is something called Community Trade Hemp seed oil. What makes hemp seed oil (not to be confused with hash oil from the cannibas plant that’s used to grow marajuana) a great ingredient for this product? Hemp see oil skin is has a 3:1 ratio of omega-6 to omega-3 fatty acids. This is important because it matches the ratio for these fatty acids that the body requires. This ratio of nutrients has been shown to be useful in fighting skin diseases like eczema. The reviewers of this ingredient have found this formula to be very good in helping hand health. 90% of all users that provide reviews give this cream at least 4 out of 5 stars. With almost 81% giving all 5 stars. This product was just under our best hand cream in the ratings. If you disagree, let us know. A few votes might push it to the top! One of the few negatives we found for this product is that the smell was distinct and unpleasant to some of the reviewers. But, only a few of the reviews made comments along these lines. Shikai is based in Santa Rosa California and has been around for over 40 years providing quality products for its customers. 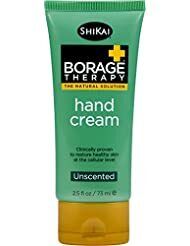 One of the Shikai products we found that is extremely popular is Shikai Borage Dry Skin Therapy Hand Cream. This inexpensive cream has a strong 4.6 out of 5 stars review rating. The Borage plant is native to the Mediterranean region. The seeds from the Borage plant are loaded with Omega-6 nutrients. Specifically GLA (gamma-linolenic acid). GLA is important with helping your skin retain moisture. Shikai has processed the Borage plant and extracted the important GLA Omega-6 fatty acid and use it in this product to provide what they believe is essential ingredients to treat your skin. The product claims to be fragrance free. But, a several of the reviewers disagreed. One described it having the smell of “wet dog”. But, then gave the cream 4 out of 5 stars. Only a one of the reviewers thought the cream didn’t work. And, several liked the smell. So, if your set on fragrance free, I might look at one of the other fragrance free creams on this page. Glysomed had taken Canada by storm. This product is the #1 selling hand cream in Canada. Reviewers give this cream an extremely strong 4.8 out of 5 stars. The only negative reviewer didn’t like the smell of this product. But, did love the fragrance free version (see here). The ingredients of importance in this cream are Glycerine, Silicone, and Chamomile. 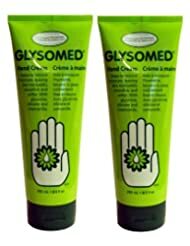 Together Glysomed believes they have found a combination that does wonders for the hands. The reviewers agree as over 95% have nothing but positive things to say. And, only two reviewers give this less than 4 stars. 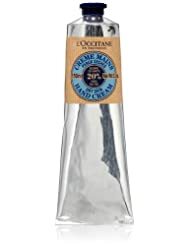 L’Occitane has been creating this hand cream for over 30 years. Olivier Baussan traveled to Africa to the country of Burkina Faso in 1980. There he found that women there were known for using Shea Butter to moisturize their skin. Olivier then purchased a large order of Shea Butter and took it back to the home offices to work on refining the product that is now called L’Occitane Shea Butter Hand Cream. This product is the most popular product we found on Amazon. Often a product with this much of a following has many detractors.But, this hand cream holds up with a strong 4.5 out of 5 stars. While looking through the 1 star reviews, I noticed a couple of the reviews claiming the product received was NOT the actual product. They claimed the product was an imitation. So, be sure to use a highly rated online company when ordering this product as it seems some of the more shady online stores are trying to pull a scam with this product. It’s really too bad, because for those that think they got the right product, the reviews are extremely positive. A few of the negative reviews didn’t like the smell. So, if you’re looking for something fragrance free, this probably isn’t the product for you. However, with the reviews as good as they were, it’s likely you might find this to be the best hand cream on this page. All of the products above are strong candidates for the best hand cream. They each have unique features. We don’t believe you can go wrong with any of these products as your best hand cream for dry hands. Any of these team might come out as the winner of this East/West Hands Division. Thank you for your advice. I agree that staying out of the sun is really great advice. Eating a “carrot in the food salad” helps with Vitamin A which is great as it enables your skin to increase cell production and growth.